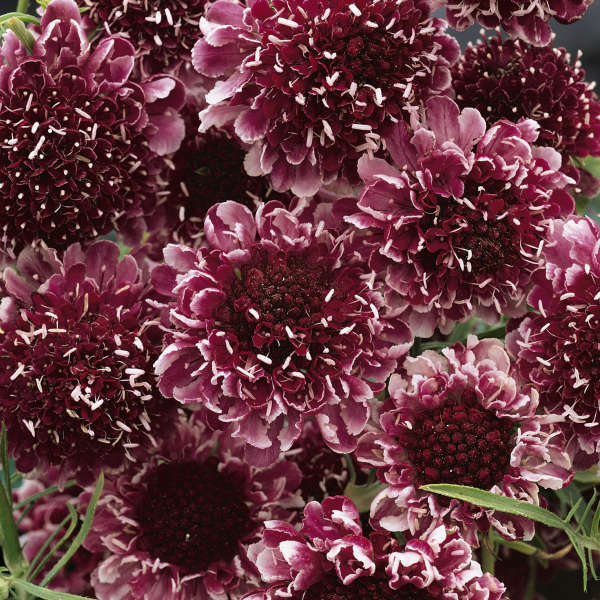 Adding to the array of Scabiosa colors is this rare burgundy flowering selection. Light red petals surround the deep burgundy center with protruding white stamens. These flowers are carried on tall, wiry stems above a bushy mound of green foliage from late spring through midsummer. 'Beaujolais Bonnets' makes an interesting addition to fresh bouquets and attracts butterflies to the garden. Scabiosa grows best in average soil and full sun. Good drainage is essential for the health of the plants. Deadheading will promote a longer blooming period. In the fall, cut back any flowering stems to help the plants prepare for winter.